Star Plus’ Kasautii Zindagii Kay season 2 has topped the charts across all the primetime channels slots. 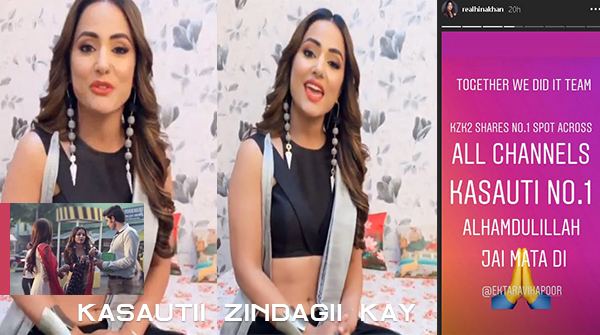 Hina Khan went on to the popular social media platform, Instagram to share the wonderful news. Continuing her rank of having each show reach the top #1 slot, she was very excited to announce the news and also sung the title song of the most loved show, Kasautii Zindagii Kay. The show starring Erica Fernandes, Parth Samthaan and Hina Khan has gained popularity. Hina’s voice will make you wonder for a second if she will receive an opportunity to sing for the show which has managed to create a new history after launching the season after being compared to the previous season. We wish the cast and crew the best and hope they continue to showcase their best talent! Have a look at Hina Khan’s message. 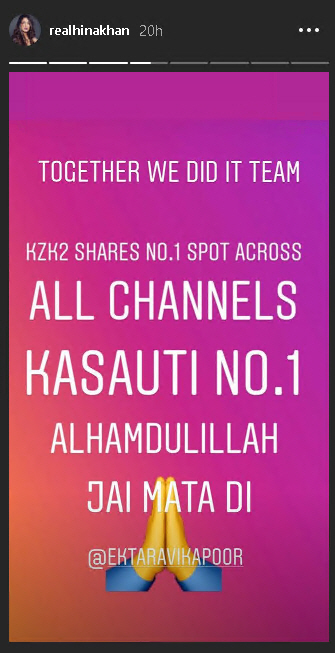 Co-actress Pooja Banerjee also shared an Instagram story cheering on the team for the wonderful news. But I can’t wait for Hina to be out of KZK2!!! !